Silver Linings Playbook is another classic and well-known movies for Jennifer Lawrence besides Winter's Bone and The Hunger Games. We do not know if Silver Lingings Playbook will turn to be a classic Oscar-awarded movie until the important movie celebration held on 24th Feb. Howerver, if you are Jennifer Lawrence or Bradly Cooper's fans, no doubt that would like to buy a DVD version for this movie and review it in your spare time. Not to mention to copy the movie on hard drive or create DVD copies, convert the DVD to videos for playable on your mobile phones or tablets. 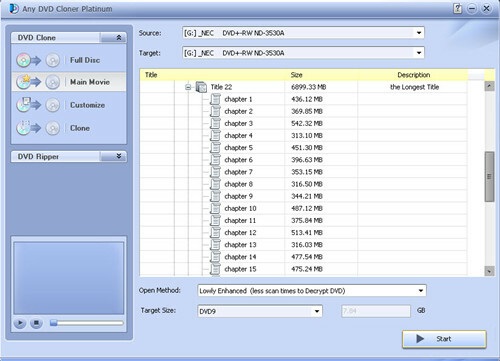 Any DVD Cloner Platinum is a powerful backup tool with powerful and complete features for copying or converting encrypted movie DVDs: copy DVD on hard drive as DVD Folder or ISO Image File; clone DVD to blank DVD disc; convert DVD to three video formats: M4V/MKV/MP4 for playback on portable devices like mobile phones or tablets. In short, you can make DVD copies or convert DVD to videos for Jennifer Lawrence and Bradly Cooper's Oscar nominated movie - Silver Linings Playbook in the easiet way and perfect quality is guaranteed. How to copy/convert Silver Linings Playbook to blank DVD disc/videos with Any DVD Cloner Platinum? Let's copy the movie to blank DVD disc and convert the movie to video with step-by-step tutorial. Download Any DVD Cloner Platinum user manual right now. Step 1. 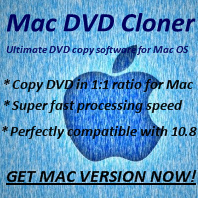 Download and install the software (Mac users can download Mac version. Step 3. Choose clone mode in "DVD Clone" panel: Full Disc, Main Movie, Customize or Clone. Want to watch the advertisment warning message at the beginning, or the NG shots after the movie finishes, should choose "Full Disc"; Want to make DVD copies in the shortest time and less space, "Main Movie" should be the option; "Customize" is selected for those like to copy certain titles while "Clone" is for copying DVD in 1:1 ratio. Step 4. Select correct Target Size. For copying Silver Linings Playbook to blank DVD disc, please make sure select the correct DVD type in "Target Size". The program may not run smoothly if incorrect Target size is selected. Choose DVD Folder or ISO Image File for backing up Silver Lingings Playbook on hard drive. Users can play DVD Folder or ISO Image File with media player software like VLC player or KMplayer, etc. Choose the same DVD drive for copying the movie to blank DVD disc. When the copying process completes, DVD Folder or ISO Image File will be saved on the target directory. DVD drive would eject when the copying process completes, user should take out Silver Linings Playbook DVD disc and put a blank DVD disc into the drive, and click "Rety" button and the burning process would continue automatically. Wait for a while, the burning process would be done and the copied DVD is created successfully. Step 1: Download Any DVD Cloner Platinum. Step 2: Click "Open DVD" to load Silver Lining Playbook DVD titles in the program. Step 3: Go to "DVD Ripper" panel and choose the portable device you have. Just select "Normal" if your mobile device is not included. Step 4: You can change "Output Format" up to your preference. There are three video formats you can select: MP4, M4V and MKV. Step 5: Choose titles for the ripping. Generally, the longest title would be selected by default. If you like to rip the whole DVD to video, then please check all titles listed in the program. You can preveiw any title in the previewing window. Step 6: Click "More Settings" to customize the output video picture, video and audio parameters subject to your portable device and up to your preferences. Or you can leave all by default settings. Step 7: Click Start buton to rip. Wait for a while, the output video will be generated with success. Then transfer the file to your portable device for watching freely. 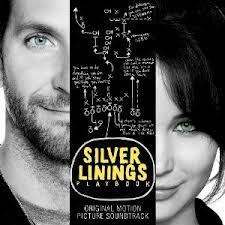 Silver Linings Playbook has eight nominations in 85th Academy Awards, including the best actor and the best actress. What Silver Linings Playbook talks about: after a stint in a mental institution, former teacher Pat Solitano moves back in with his parents and tries to reconcile with his ex-wife. Things get more challenging when Pat meets Tiffany, a mysterious girl with problems of her own. Jennifer Lawrence and Bradley Cooper they got along so well that they often spoke about working together again in the future. When Lawrence read the script for Serena (which is directed by Susanne Bier and will be released in 2013), she sent a copy to Cooper and asked if he would do it with her.